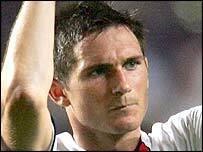 Frank Lampard said England's players were "gutted" after their dramatic Euro 2004 penalty shoot-out exit against hosts Portugal. And he led the complaints about referee Urs Meier's decision to disallow a last-minute "goal" from Sol Campbell. "We didn't play our best but we worked very hard at certain stages to get back into the game," he said. "And we had a goal at full time that was basically a fair goal taken away. There was nothing wrong with it." Sven-Goran Eriksson, who insists he will stay on as England coach, is due to speak to the media at 1230 BST. And the squad will fly home to Luton on Friday evening. Lampard, scorer of England's extra-time equaliser on 115 minutes, admitted it had been a struggle to contain Portugal at times. But he said England had shown enough mental strength to merit victory. "We showed great character (after Campbell's disallowed strike) even though the lads were obviously knackered, we came back into it and then got beaten on penalties. What can you say?" Lampard's team-mate John Terry also insisted Campbell's header should have stood. "I didn't think it was a foul and neither did Sol," he said. "Michael Owen saw the replay and people back home also said it definitely wasn't a foul. If that had gone in, we would have been through to the next stage. "It's terrible. The linesman gave it and the referee overruled him. We're so disappointed. We're just gutted that we're not through. "We didn't get much luck from the referee. He wasn't great but we had our chances to win the game and we didn't take them." Defender Gary Neville said defeat on penalties was a bitter pill to swallow. "It's three times for me now. I suppose the cynics will say it is a mental thing and this and that," he said. Why can we not use video replays or whatever technology is around to ensure a fair result? "It was as much down to the penalty spot as anything. When you get into that it is a lottery. When David Beckham took his penalty the spot just gave way. "Rui Costa and John Terry had the same problem. If you look at John Terry's penalty he was fortunate. He actually aimed to put it in the other corner.